Ever since I've moved to Denver, my friends here have really gotten me into thrifting! It doesn't help that I also have a Goodwill only a block away from my house. I've started going there every Monday and that seems to be their most hectic day. Putting out new things and people mingling waiting for things to come out from the back. I love finding that every thrift store is different! That is what makes it so fun. You never know what you are going to find. Take your time and have an idea of what you are looking for. I like keeping a list in my phone of little necessities I need and having my collections always in the back of my mind. Goodwill has been my go to place for finding one of my new items I started collecting since moving here: globes! I've been lucky enough to find 4 out of 5 of my globes at Goodwill all for about $10 each. And they are worth so much more than that! The first globe on the left hand side is from 1950s or 60s and is worth around $40. The middle one was my first globe and it's worth almost $100! Both are from Goodwill. Both priced at $9. The globe on the right hand side if from the most amazing place on Earth...or in Denver: The Brass Armadillo. This place is a Costco sized palace of amazing treasures. Ocean Eyes and I went there one day for two hours and only did half of the store! That globe was the most at $25. And they had many, many more! The front counter probably hated me, but I sent up about 5-6 globes I liked and picked just one! And it ended up being the first one I found! It has been hit or miss finding globes at Goodwills. But in my 9 months of living here I've found 4 globes just at the one by my house alone. The trick is to go as much as possible and for me Monday's are my days off so that is when I stop in. On Sunday's both Ocean Eyes and I can go thrifting together and that is even more fun! I am so happy he enjoys it as much as I do. 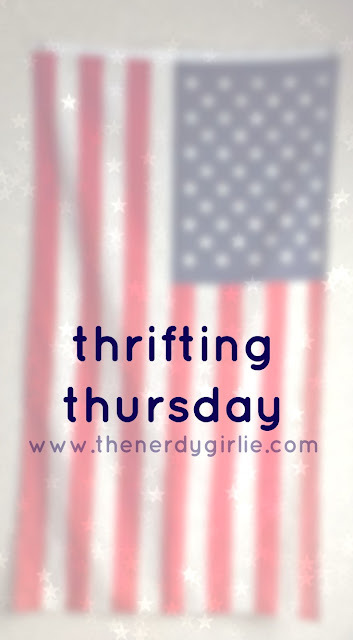 Do you like thrifting?! Do you collect anything?! Share your stories in the comments below and come back next week I will talk about Ocean Eye's and our adventures thrifting something we BOTH collect! Do you have a guess?! Your globes look so nice. I barely have time to thrift, but when i do its so much fun. I love thrifting! I bought a Hulk pullover sweater for 5 bucks and a couple t-shirts for 3 bucks and they're amazing. Such beautiful globes. I also have a little obsession. Well, with anything map related really. I love thrifting! Though I haven't done too much of it this year.